On April 10 our LifeNets representative Dr. Yumi Yamamoto received a request from a nurse, Mrs. Sato, in the affected Fukushima area. There is a seven year old boy Tatsu who has a small inborn eye ball and has been wearing an artificial eye. His house was completely destroyed by the earthquake. 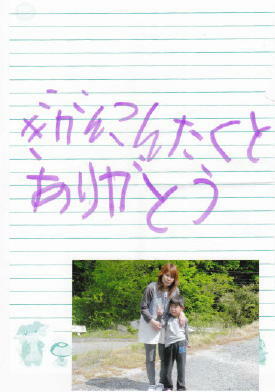 In Japan April is a new school term, and just a few days ago he had a celebration ceremony of entering elementary school. Because he is getting bigger, his artificial eye got smaller and parents wanted to buy a new one for him. If he suffers from a defect of the complete eye ball, the government will pay for it, but because his problem is a "small eye ball', there is no way to get any help. The cost is about 90,000 yen ( about 1125 USD). Tatsunori became a first grade student of elementary school in Fukushima, Japan. 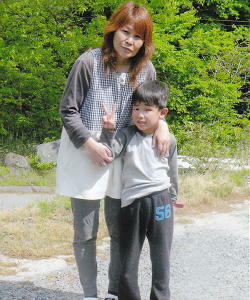 Fortunately he and all his family survived from the earthquake and the tsunami last year. Now his parents are working very hard to build a new house. Tatsunori is a healthy cheerful boy who enjoys his school life very much. His only health problem is he was born as anophthalmia (congenital defect of the eye when a baby is born) and he wears an artificial eye in the left eye. Because he is growing bigger now, it was time that he needed a new artificial eye, but Japanese public medical insurance does not cover the charge of it and his parents could not afford to pay for it. His parents knew it was one of the most necessary things for the boy to start a new life in elementary school with many other new friends and people, and they were sad because they could not afford it. LifeNets Japan heard of him and decided to buy a new artificial eye for the boy. Now he and his parents are very grateful and happy. Thank you very much for your help for our son. We never forget the day March 11th, 2011 when the earthquake destroyed our house. Now we are working to build a new house and start a new life with five of our family. We have been struggling hard but we could not afford to buy a new eye for my son. Now he goes to school everyday with his new eye and we are very happy to see he enjoys his school life. By assists of many people, we try to go forward one by one. Thank you very much." 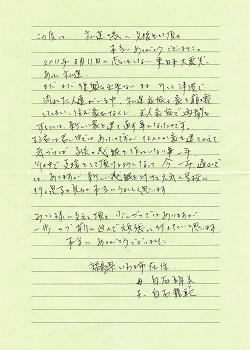 Here is another letter from Tatsunori himself. He wrote "Thank you for the new eye."